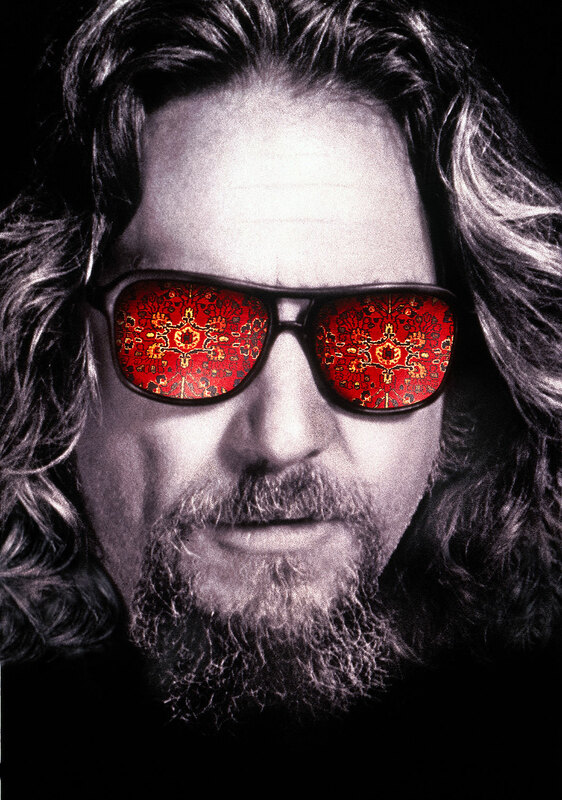 I went to a midnight screening of The Big Lebowski last night at the Music Box Theater. Although it’s great on DVD, (which is how most of its rabid fanbase usually views it — sometimes turning it into a drinking game with a couple of jays and some White Russians no doubt), on the big screen, it’s a revelation. 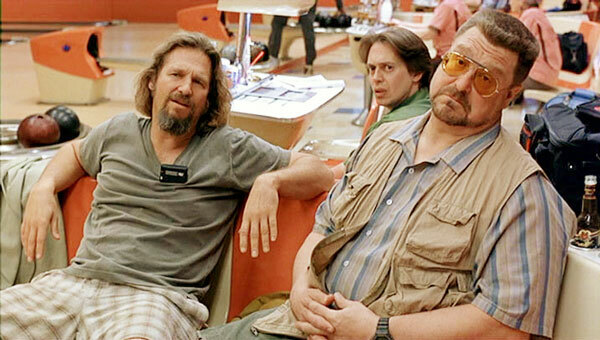 Not only is The Big Lebowski hilarious and quirky, but it’s much deeper than that. It’s pure cinematic bliss and it’s a film that has actually gotten better with time, as evidenced by its large and evergrowing band of followers (el Duderinos?) and the festivals dedicated to it. How is it that a film that flopped upon its initial theatrical release back in 1998–it was obliterated by Titanic at the box office, opening in sixth place and disappearing shortly thereafter–became a cinematic touchstone for so many? Joel and Ethan Coen (who wrote and directed Lebowski) are famous for their precise attention to detail, rivaling Stanley Kubrick in the amount of time they spend mapping out each shot (sometimes for months on end). Take the film’s opening, for example, where we follow a blowing piece of tumbleweed through the desert at the peak of the magic hour and then onto the seedy streets of Los Angeles on a late summer night. It is at this moment that we first see Jeff Lebowski, the Dude–the icon of Genration Y, skimming the grocery aisle for half an half. This first sequence is sublime and is a good representation of what’s so appealing about the film as a whole. It’s an example of every possible filmic element, in the words of the Stranger, “fitting into place”: the music–“Tumbling Tumbleweeds” by the Sons of Pioneers; the gorgeous cinematography by Roger Deakins; the pitch-perfect tone of humor–it brings you right into that world. And it introduces the Dude as mythological folk hero of sorts. And that’s not actually too far off. The Coens, of course, owe a lot to Robert Altman‘s The Long Goodbye, a Neo-noir that’s similarly affecting. Both films are whacked-out versions of Raymond Chandler novels (the Coens meant the title to be a direct homage to his novel, The Big Sleep), set in L.A. and offering a broader commentary about American culture. In The Long Goodbye, Altman’s aim is the 1970s; specifically, the burnt-out hippy dippy culture left over from the swinging sixties. He also touches on the Hollywood culture, where everyone you meet wants to be star. In a sense, the Coens have that same aim. But they go even broader. 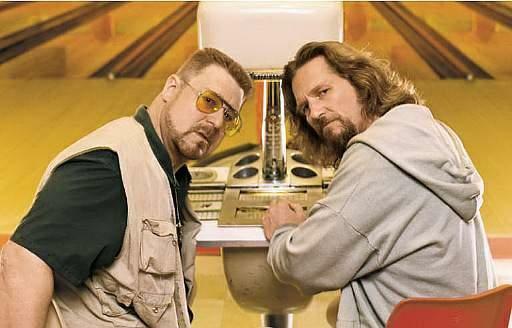 Although The Big Lebowski takes place in the early nineties and has a clear post-Vietnam/Gulf War flavor (The Dude’s mimicking of the Bush Sr. quote — “This aggression will not stand, man” — and the surreal dream sequence with Saddam Hussein), the culture of the 1970s is very much embedded into it as well. The Dude is a man who has not conformed to modern society at all. In fact, the more you analyze what era the film represents, the more the time period becomes indeterminate. As is common with other Neo-noirs, The Big Lebowski feels timeless and undated. Altman’s version of the classic hardboiled detective, Philip Marlowe, is a passive anti-hero; a man who waltzes through life doing his own thing, only dealing with conflict when pushed to the absolute limit. Elliot Gould nails him flawlessly: the mumbling, the fearlessness, the dazed expressions. 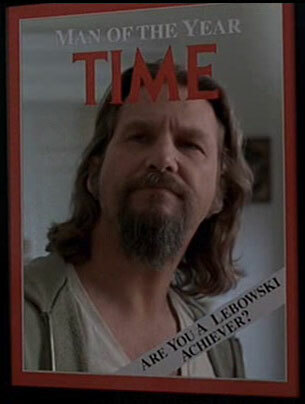 Jeff Bridges brings those same qualities to the Dude. The difference between he and Marlowe, though, is that the Dude settles for even less and he’s fine with that. He’s no detective. When asked about his occupation, the Dude assuredly replies “unemployed” without a hint of abashment. He just exists. That’s the key to The Big Lebowski. I, like millions of other fans, see a lot of myself in the Dude. He’s the ultimate free spirit; somebody who glides through the chaos of society nonchalantly, happy as long as he can sip on a White Russian, go bowling and listen to his CCR cassettes without any interference. That’s really the pivotal quality that accounts for Lebowski‘s staying power. It’s the fully realized characters–not just the Dude, but all of them–that make it a special film. Not only are they vivid and hilarious personalities, but they have real weight and depth. Their ideals are strong. I was discussing John Goodman‘s character, Walter the Vietnam vet, with somebody after the screening. What’s wonderful about him is that he exudes an intensity of years and experience, one that transcends the boundaries of cinema. There’s a definite history with him. Because of that, the audience is with Walter from the get-go. In his world, every crazy antic (pulling a gun on Smokey during League Bowling), every iron-fisted rant (“Say what you like about the tenets of National Socialism, Dude, at least it’s an ethos”) and every fiber of his being is completely organic. His intensity is believable and his motives are convincing. The widespread appeal of Lebowski closely mirrors the Dude’s philosophy of the little things in life being the most paramount. Plot doesn’t matter. 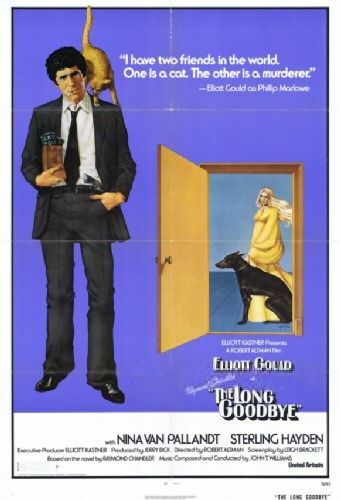 That’s true for The Long Goodbye, too. Both films feature Chandler-esque setpieces involving missing money, murder and two-faced antagonists. But that’s not what makes them great. Think about it. 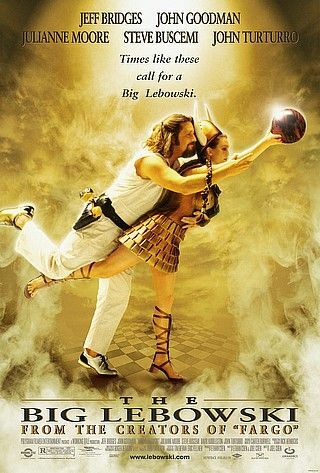 Can you honestly label Lebowski as a bowling movie (note: The Dude is never actually seen with a bowling bowl in his hand)? A mystery? A screwball farce? A stoner comedy? No. Because none of that matters. It’s the mood, the feeling, the sensory experience…qualities that are missing from a lot of the clones that have followed in its wake (compare it to the dreary, hollow Pineapple Express, for example). FLOP, POP, FIZZLE, The Obligatory Weekend B.O. Report: Disney’s ‘Carol’ Dethrones ‘This Is It’, ‘Precious’ Scores Big THE WEEKEND MARQUEE: ‘A Christmas Carol’ Comin’ At Ya!